In DLI Memorial Chapel, Cathedral Church of Christ, Blessed Mary the Virgin and St Cuthbert of Durham, Palace Green. 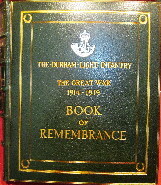 Book of Remembrance, in glass fronted revolving case, overall height 6 feet. and approx. 30 inches x 18 inches (762mm x 457mm) mounted on a scrolled and gilded pedestal. The title is incised into the top of the case. The pages bear an individual inscription in calligraphy with the badges of the regiment and the DLI in top corners raised and silvered. 1. If any visitor wishes to see a particular entry in the Book of Remembrance, the Verger's Office, next to the Memorial Chapel, should be approached, and they will be pleased to assist. 15  Pte. F. Jacques              18  Pte. W.H. Rushton                      1917. 18  Pte. T.H. Lucas              15  Pte. W.R. Stamper                      1918. 15  Pte. McLehaney              18  Pte. C. Thornton                       1919. 15  L/Cpl. C. Lines                        1918. 18  Pte. E.A. Davies                       1918. 18  Cpl. P.A. Snow                         1918. 1/7 Pte. R. Barber                         1918. 12  Pte. J. Davison                        1918. 1/7 Pte. J. Elliott                        1918. 1/9 Pte. W.H. Minniken                     1919. 12  Pte. J. Graham                         1917. 12  Pte. J.W. Horspole, M.M. 1918. 1/5 L/Cpl. W. Wood              14  Sgt. T. Pearson, M.M. 13  Pte. M. Cavanagh                        1918. 13  Pte. W. Alliston                       1917. 12  Pte. H. Harrison                       1918. 15  Pte. B. Johnson              18  Pte. W. Grant, M.M. 1/5 Pte. G.W. Allen                         1918. 2  Pte. M.B. Baird                         1919. 1/9 Pte. J.E. Martin                       1918. 1/9 Pte. G. McLeay                         1918. 1/9 Pte. W. Montgomery                     1918. 12  L/Sgt. C. Goodwin            12  Pte. W. Hogg                           1917. 12  L/Cpl. D. Graver             15  Pte. A. King                           1918. 19  Pte. J.T. Calvert                      1917. 19  Pte. S. Jackson                        1918. 19  L/Cpl. R. Breyer             1/6 Pte. T. Humble               18  Pte. F. King, M.M. 18  Pte. N. Henderson                      1918. 9  2/Lt. D.A. Brown                       1918. 19  L/Sgt. G.B. Miller                     1918. 20  Pte. H. Nagel                          1918. 13  Pte. S. Burns                          1917. 18  Pte. H. Graham                         1918. 10  Pte. H. Betts                          1918. 20  Pte. C.W. Goodyear                     1918. 10  Pte. J. Shaw                20  Lt. T.M. Fletcher, M.C. 20  Pte. J.J. Baker                       1918. 15  Pte. D. Gardiner                       1918. 18  Pte. H.P. Goodwill           22  Sgt. T.Y. Temple, M.M. 18  Pte. J. Marshall             1/9 Pte. C.S. Reid, M.M. 13  Capt. A.H.P. Austin                    1917. 13  Pte. R. Etherington                    1918. 2  Pte. T. Mockler                        1917. 13  Pte. T.H. Lattimer, M.M. 2  Pte. R. Sayer                          1918. 2  Pte. K. Morrison              2  Pte. J. Riley                          1916. 2  Pte. E. Morton                2  Pte. T. Robson               12  C.S.M. J. Fisher, D.C.M. 2  Pte. P. McCarthy              2  Bandsman H.H. Salt                     1917. 2  Pte. R. McKenzie              2  Pte. F. Smith                          1918. 18  Pte. J.B. Barnard                      1918. 10  L/Cpl. J. O'Rourke                     1917. 10  Pte. R. Anderson, M.M. 1918. 14  Pte. E. Burton                         1918. 1/5 Pte. R. Bell                           1918. 1/9 L/Cpl. T. Bevil                        1918. 10  Pte. C.J. Birkett                      1918. 10  Pte. A.L. Cameron            1/8 L/Cpl. J.J. Armstrong, M.M. 10  Pte. J.F. Bebington          10  Pte. T.B. Jones                        1918. 19  L/Cpl. J. Robinson           10  Pte. J. Thompson             15  Pte. W.B. Eaton, M.M. 15  2/Lt. C.W. Bodman (Tp)       15  Pte. A. Jackson, M.M. 19  L/Cpl. H. Lyth, M.M. 19  Pte. I. Atkinson                       1918. 11  Sgt. H.A. Clasper                      1918. 10  L/Sgt. J. Slack              10  Pte. J. Payne                          1918. 11  Pte. T. Mesham                         1918. 10  Sgt. M. Parker                          1918. 1915. 19  Pte. M. Thompson, M.M. 1/8 Pte. G. Gowland                        1918. 18  Pte. J.W. Race                         1918. 20  Pte. H. Frater                         1917. 12  Pte. T. Langton                        1918. 20  Pte. J. Armstrong            20  Pte. W. Wilkie, M.M. 5  Capt. H.R. Wilson, M.C. 10  A/R.S.M. H.W. Davison                  1918. 20  Pte. W.T. Todd               1/9 Pte. A. Innes, M.M. 1917. 12  Pte. G.W. Kilburn, D.C.M. 20  Pte. J.H. Crinson            1/9 Pte. W. Jackson, M.M. 1/9 Pte. J. Skilbeck, M.M. 19  Pte. F.W. Nichol                       1917. 1/9 Pte. E. Nolan                1/9 L/Cpl. J. Colgan, M.M. 20  Pte. A. Peart                          1918. Bn. 1916(contd.) Bn. 1916(contd.) Bn. 1916. 10  Pte. F. Scotton              10  Pte. J. Turnbull                       1917. 20  Pte. C. Schofield             2  Pte. C. Vest                 20  Pte. J.M. Darrell, M.M. 10  Pte. T. Sinton               15  Pte. T. Wake                           1918. Bn. 1915. Bn. 1916(contd.) Bn. 1917. 1/5 Pte. E. Geldart                        1918. 14  A/C.S.M. J. Addison          1/5 Pte. A.E. Hickman            18  Cpl. F. Wright, D.C.M. 11  Pte. T. Laws                 13  Pte. J.J. Wilkinson, M.M. 1/8 Pte. C.B. Naulls                       1918. Bn. 1914. Bn. 1914(contd.) Bn. 1917. 2  Sgt. A.E. Whitefield          2  Pte. J. Nevison               3  2/Lt. P. Braidford, M.C. 2  L/Cpl. H. Grant               2  Pte. R. Nicholson            13  2/Lt. (T/Capt) H.C.
12  2/Lt. J. Bollom                        1917. 18  Pte. E. Evans                           1918. 12  Pte. T. Gallagher             2  Lt. (A/Capt.) Moss Cohen, M.M. 15  Pte. J. Storey                         1917. 2  Pte. J. Brewin                         1918. 12  L/Cpl. R.R. Jackson                    1917. 1/6 Pte. C. Blackett                       1918. Bn. 1914. Bn. 1915. Bn. 1916. 15  L/Cpl. F. Milburn            14  Pte. J.W. Robson                         1917. 14  Pte. G. Corker               14  Pte. T. Taylor                          1918. 14  Pte. S. Ashcroft                       1917. 1/9 Pte. J. Raine                18  Pte. T.R. Vockuich, M.M. 2  Pte. W.C.R. Owens            20  Pte. W. Grieves                        1917. 10  Pte. J. Williams             1/9 Pte. G. Harrison                       1918. 9  Lt. W.E.O. Scott             1/9 Pte. W. Kelly                20  Sgt. J.E. Thompson, M.M. 21  2/Lt. C.H.D. Mann (Tp)                 1918.